Bill is an IT Consultant with 30 years’ experience in the IT industry. His passions are helping people, solving problems and finding ways to make things as efficient and as effective as possible. Initially Bill started as a computer programmer developing and maintaining large applications within the Finance industry. His passions quickly lead him into systems management and project management roles, where he was always looking for a better way of getting the results the customer needed. His flair for process improvement often found him implementing new processes within the organisation and lead Bill to become fully qualified in IT Service Management, where he currently holds an ITIL Expert (V3) qualification. 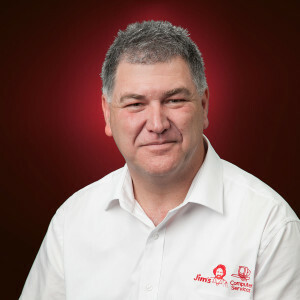 Now, as the owner of a Jim’s Computer Services franchise in the Drouin area, Bill is uniquely positioned to help small to medium businesses within the Gippsland region to make the most out of their technology, what they own today and what they would like to achieve with it in the future. He can apply his vast IT knowledge from within the corporate world, in a way that will help their business gain the most value from technologies available to it. Based in Drouin, Bill covers much of Central, Western and Southern Gippsland, including Sale, Traralgon, Morwell, Moe, Warragul, Drouin, Leongatha, Korrumburra, Inverloch and Wonthaggi. He is also available to cover the South Eastern parts of Melbourne. Bill’s experience means he is able to manage almost any area of IT with particular skills in IT Governance consulting, IT Service Management consulting, IT Project Managementconsulting, IT Programme Management consulting, Microsoft Project, Systems and Applications Development and Maintenance, IT Monitoring, Desktop upgrades, Internet Security Management, Website Development and Maintenance and IT Sales. Through his partnership with other Franchisees and suppliers he is able to help provide most other areas of IT including IT Security solutions, IT Cloud solutions, Data Managementsolutions, Server Management solutions, Network Services solutions, repair and maintenance solutions, as well as many other technology solutions (i.e. POS solutions, Social Wifi).